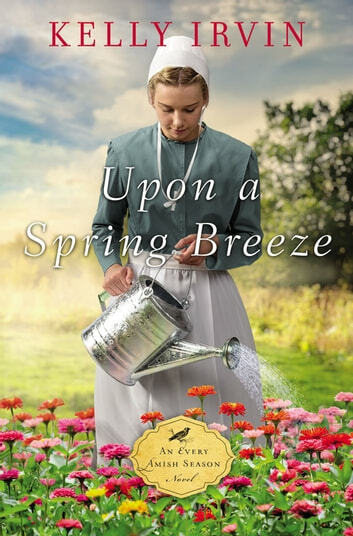 Upon a Spring Breeze has a lovely cover that does not convey the angst inside. At the very beginning Bess suffers the loss of her husband of only one year. She is also one month away from delivering their first baby. She struggles throughout the novel with her loss and her place in the Amish community. She also questions God and why he would allow this to happen. Clearly shown is how the Plain people pull together in a crisis but also how women are supposed to submit to the men. Bess has a hard time with this sometimes. She lives with her inlaws and that to me would seem hard. She feels like she needs to pull her own weight outside the home for her and her little son. This is about struggles, understanding God's will and healing from a deep hurt. Also about forgiveness and learning to love again. I enjoyed seeing the progression of Bess and her thought process over a period of many months. It took a crisis for her to finally see what she needed to do and how she had matured over time. I received this book from the Fiction Guild and was not required to write a review. A lovely book about renewed hope after tragedy strikes. Sometimes we're ready for the hope God provides, and sometimes it takes time to accept that life can be good again, that there can be new beginnings and second chances. As always, I enjoyed Ms. Irvin's story telling. I received the above book from the publisher/author. This review is my honest opinion.